Farabee and O’Sullivan. Photos by Michael Brosilow. American Theater Company’s world premiere of Bruise Easy is a troubling play about two siblings trying to establish a relationship after years of estrangement and a lifetime of parental neglect. They meet again in the driveway of the family’s rundown suburban home in southern California, ca. 2005. At first they’re disconnected, unable to find any kind of conversation. Alec (Matt Farabee) has parked himself in the driveway, fiddling with his camera. Tess (Kelly O’Sullivan), pregnant and getting over a breakup, has come home to see her mother. Mom is expected but MIA. Dan LeFranc’s script takes us through this awkward renewal of family connections and the gradual exposure of family history and the actions of both father and mother. Director Joanie Schultz is a Chicago-based freelance director who has directed productions in Washington DC and Kansas City as well as many Chicago shows. She draws fine performances from the two actors but the delicate timing of the play is uneven. 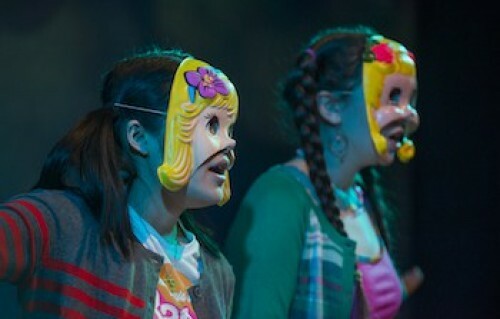 Transitions are handled by a six-member chorus, wearing half masks. The script has overtones of Greek tragedy and the chorus makes that clear in their opening speech. The Greek tragedy analogy continues in the brother-sister relationship and its dissing, kissing, loving, fighting conflict throughout the play. Chorus members are part of the ATC Youth Ensemble, which researched and produced the excellent Greensboro Requiem last summer. This is the first time Youth Ensemble members have performed in an ATC mainstage production. Despite the play’s brevity (it ran ~80 minutes on opening night), there are times when it drags. It takes time to build the sibling relationship and tease out the parental impact. But the first half of the production is painfully slow. I think music would help create and sustain the mood that Le Franc’s script tries to build. Some moody strings, some mournful horns and a little low-key percussion between and during scenes could help turn Bruise Easy into a more compelling drama. Sound designer Thomas Dixon does well with crickets and other nighttime noises. The simple set design by Chelsea Warren features a suburban garage door (which opens late in the play to reveal typical suburban garage detritus) and a sloped driveway. The stage backdrop design flashes during transitions—clouds, geometric forms and wavy ribbons pulse with light and color. Dan LeFranc is the playwright in residence for Playwrights Horizons, New York. He received the 2010 New York Times Outstanding Playwright Award for Sixty Miles to Silver Lake, premiered by Page 73 Productions and Soho Rep. ATC’s world premiere of his play The Big Meal in 2011 received five Jeff award nominations. Bruise Easy will be staged through Feb. 14 with performances at 8pm Thursday-Saturday and 2pm Saturday and Sunday at American Theater Company, 1909 W. Byron. Tickets for $43-48 can be purchased online or by calling 773-409-4125. Reposted courtesy of Nancy Bishop and Third Coast Review.